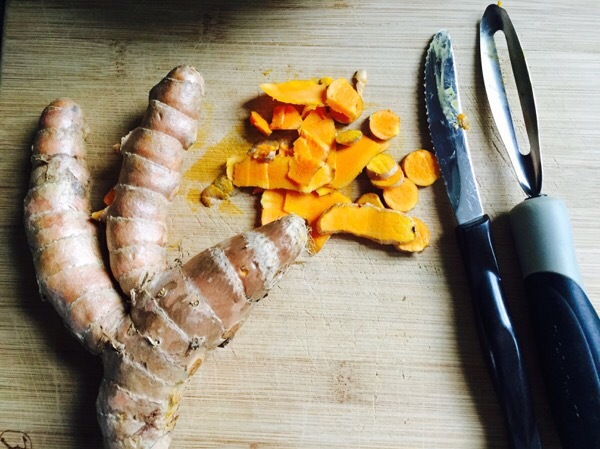 Turmeric for Arthritis & Beyond! 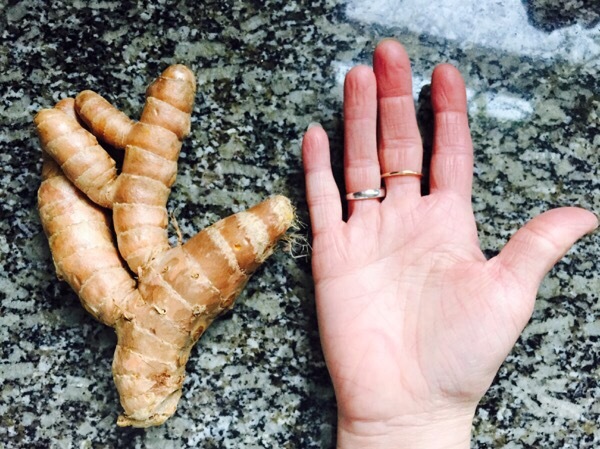 I bought a chunk of turmeric today shaped like my hand - which I also intend to use for the benefit of my hands. (Pretty cool!) It was just sitting there waiting for me in the produce section at Whole Foods. It was just $4 and I'm stoked to begin drinking it as a tea. Turmeric was recommended to me by my Naturopath for inflammation in my hands and throughout my body, and the hormonal imbalances that I've had as of late. After completing my 14 Day Juice Fast last week, I'm really motivated to eat better for my body. I'm going to work to stay ahead of the inflammation-curve! I've cut out the organic-decaf for starters; my ND tells me it's likely too acidic for my system to drink it daily. I will enjoy it for a treat, probably once a week or so. Decaf is often processed with toxic solvents for the decaffeination process. If you do indulge, find an organic decaf that's "Swiss-Water Decaffeinated" for the cleanest coffee possible. Google it! I've also committed to cutting the dairy and sugar out whenever possible. At times I can be a bit of an ice-cream-oholic! I've got to tone it down some! I went out and bought lower sugar, coconut based ice creams for when the mood strikes. I'll be reducing wheat to an absolute minimum as well. It cleans and tones the liver, which is great for recovering alcoholics, those with hormone imbalances, PMDD, irregular cycles, infertility, migraines, eczema, and anyone that wants to be as healthy as possible. Turmeric is anti-neoplastic, which means that it kills CANCER! Additionally, it helps to emulsify fat. Which is great for those that no longer have a gallbladder. It's wonderful for supporting healthy levels of inflammation in the body. So perfect for people like me who have chronic pain from arthritis or any other inflammatory problems. It could be the inflammation of the intestines, the joints, the feet. Whatever! Most problems in the body are inflammation-based problems. The tea tastes a little spicy-comparable to ginger but a little different, more earthy. If you're a hard-core herbal tea junkie, you'll probably like it. For those that need it easier, faster, more concentrated, and less "sipping"; do a tincture. Three droppers full of liquid tincture turmeric each morning (a good brand is Herb Pharm) is a GREAT start! Put it in a shot glass with 1 ounce of water and down the hatch!